Learning and development professionals have known for some time that the keys to making training stick include interaction with participants before, during, and after a learning event. Evidence-based strategies for transfer of training such as setting positive expectations, designing effective activities for application, and reinforcing learning are even more important to use with elearning than with face-to-face training.The opportunity to engage learners with back-and-forth interaction is limited or non-existent. My book Making Elearning Stick has a model that summarizes the latest evidence-based strategies to support good transfer of elearning. It outlines 20+ specific techniques with many variations that can be applied to new or existing self-paced elearning and live virtual training, so participants will remember and apply what they learn. And isn’t that the point? Research evidence shows that adding just a few “extras” to live virtual training and self-paced elearning will increase participants’ application of their learning to the job. Raptivity interactions which I call tools provide attractive and engaging ways to include these “extras.” Below are a few examples from my book of easy-to-use Techniques to Integrate Education (“TIEs”), linked here with Raptivity tools. TIEs can be used with any training content. Choice of specific Raptivity tools may vary with the type of training content. 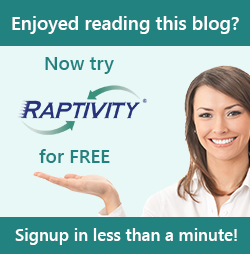 Note: This blog has been posted by Raptivity Marketing team on behalf of Barbara Carnes. Subscribe to her free monthly newsletter Sticky Notes www.MakeTrainingStick.com and more information on Making Elearning Stick and my other books on training transfer.